With a global focus on renewable and sustainable energy, the concept of turning the typical gym workout into usable energy sources is kind of a no-brainer. The American population became familiar with the energy bicycle in the popular television show ‘Living With Ed’; where environmentalist Ed Begley, Jr. required everyone to contribute to the energy needs of his house through bicycle riding (even neighbor Bill Nye, the Science Guy). A community in the United Kingdom has taken the idea into the local gym and it’s no surprise that they are helping to power their town through their workouts. The company has installed around 350 of these human-to-energy converters in gyms around the U.K. These are paid for by the local councils and offered free of charge to the residents. The goal is to encourage local residents to change their couch potato habits and participate in more exercise. The thought is that there might be more people to participate if they know that they are making a green-contribution. The ultimate goal for each of the gyms is to have enough people involved in gym workouts that the renewable energy will feed into the power grid and eventually reduce the cost of electricity. This is a brilliant concept as it addresses the need to exercise while appealing to the average budget. The concept has caught the attention of local community leaders from around the world, including developing countries, where renewable energy technologies such as hydroelectric power stations, solar power cells and solar heating can accommodate the renewable energy gym environments. The current initial cost of the Hull prototype is nearly $100,000 (including installation), but there are new plans for a lesser cost $32,000 model which would offer the ability to charge mobile phones. The largest of the prototypes cost around $130,000, but these are powerful enough to feed energy back into the grid. The use of renewable and sustainable energy in such a novel way not only creates a situation where the people become healthier but want to participate as a contribution to their community and brings the topic of sustainable energy to the forefront. The Hull prototypes, as well as the sustainable energy gym concept may soon be an integral part of the green effort planning in towns on a global scale. As the popularity of the technologies expands, the cost will inevitably be reduced, allowing more lower income communities to participate. Posted on May 15th under Renewable Energy Sources. I think they took this idea from that popular television show. No matter where they got it, it’s fantastic. We might even see more people signing up to exercise, if they think they can generate power. What a concept! Leave it to the Brits to develop something this genius. Hopefully, the cost will come down so that not only standard countries but the developing countries can use it. Would love to see this in my town, where a majority of people are overweight and the lines are never ending at the fast food drive ups. Anyone know if this is going to be available in other countries? 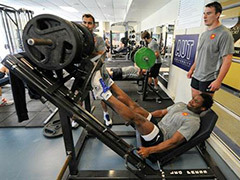 I would love to have this equipment in our gym. I am there twice a day, every day and so are a few of my friends. We could probably power enough energy to keep our electric bills are zero. If they made a portable, wireless version of this we could attach it to ourselves and have every movement of every day contribute to our power needs. This means that those of us that walk for exercise could keep our homes and businesses powered and return the excess to the grid.